Today has been a shop-day (as opposed to a workshop-day or a little-of-both-day). I’ve been dusting and wiping and hoovering and re-displaying. Tadá, here’s the result! 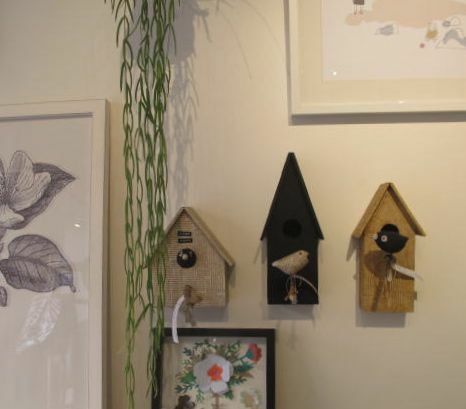 I’ve blended in the range of Edition Paumes that arrived yesterday – Copenhagen Apartments, Paris Creative Couples and Kawaii Stores Stockholm to mention just a few and all lovely of course. 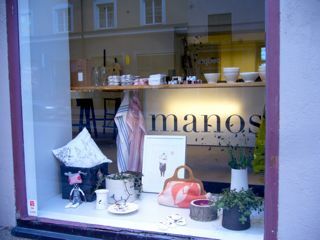 We’ve re-displayed at manos and are welcoming 2011 with blissfully light and spare window displays – see them here. 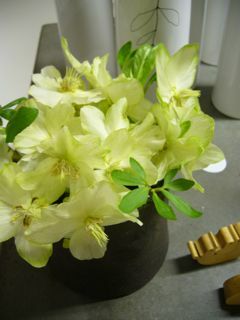 The hellebore are still beautiful as a small bouquet. 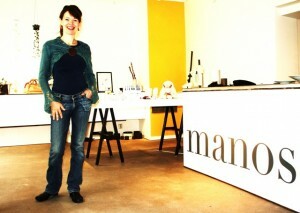 I have excellent help at manos these days – another Karin started working with me three weeks ago. Not only is she a great help, she’s also lovely company. 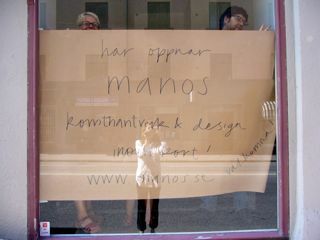 Today we re-displayed the shop windows, see them all at manos facebook page. 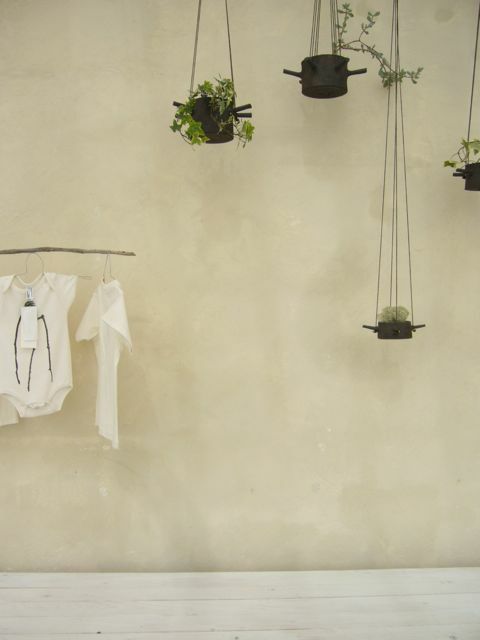 In the left hand window we have a selection of childrens clothes that are visiting from web-shop Nuno & Dudo. Hand-knitted dresses and cardigans from Shirley Bredal and eco-certified clothes knitted in merino wool from swiss Selana. 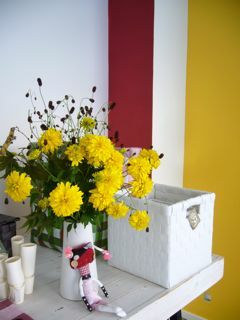 Nuno & Dudo will be our guests until Christmas. manos is now available in Japanese! 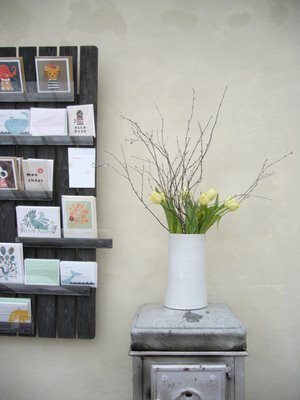 The anonymous writer will be writing about the shop and it’s surroundings. 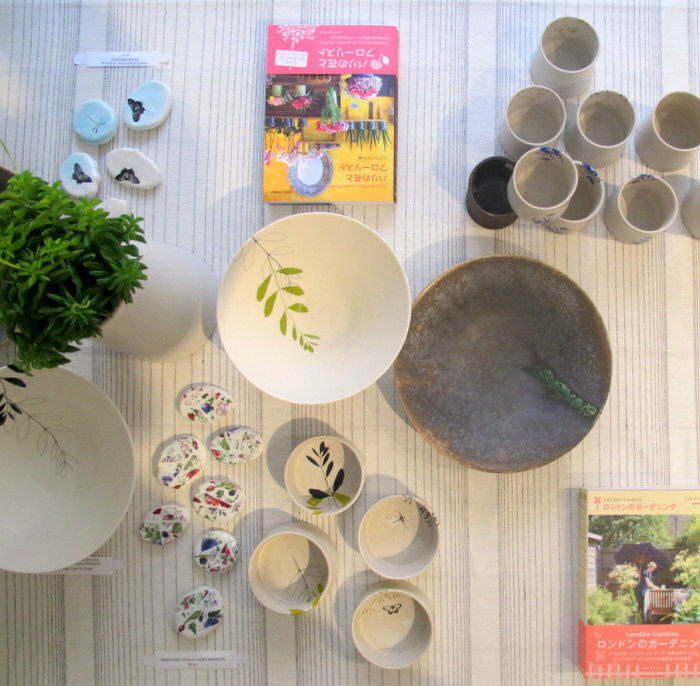 My friend Pia came to the shop the other day and took some press images, above is one and the rest are here. 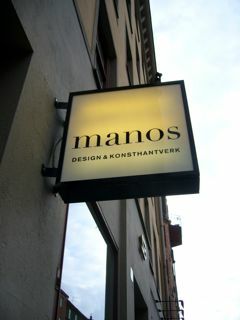 Today the manos logo was added to the shop desk. One by one, things are falling into place. 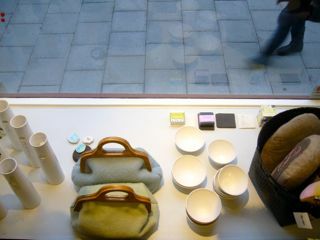 Here’s another of the three display windows. The new sign is up, now I’m just waiting for the lights to come on in the shop as well – eagerly awaiting the electricians! 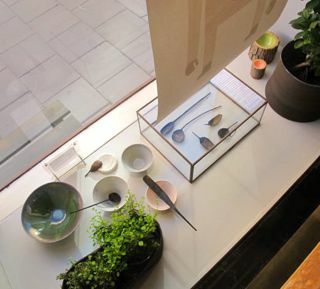 See glimpses from the shop interior here (scroll way down). We’ve spent the past two weeks renovating the new premises and today the paper came off the windows again – jippie! 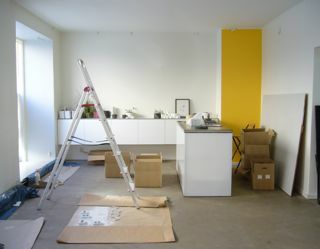 The shop will be opening up on Thursday – everything is not ready though, it’ll be a work in progress. 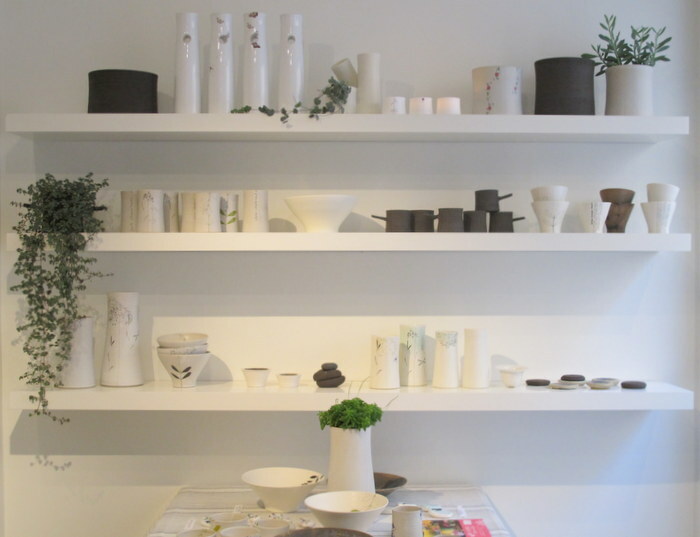 Opening hours Tuesday-Friday 12-6 pm, Saturday 11-3 pm. Welcome to Renstiernas gata 22! Nu har vi spacklat, skrapat, burit och målat och på torsdag smygöppnar manos! Smygöppnar eftersom allt inte är klart, men det är tillräckligt klart för att vi vill visa upp i våra nya lokaler på Renstiernas gata 22. Öppettiderna är tisdag-fredag 12-18, lördag 11-15. Välkomna! 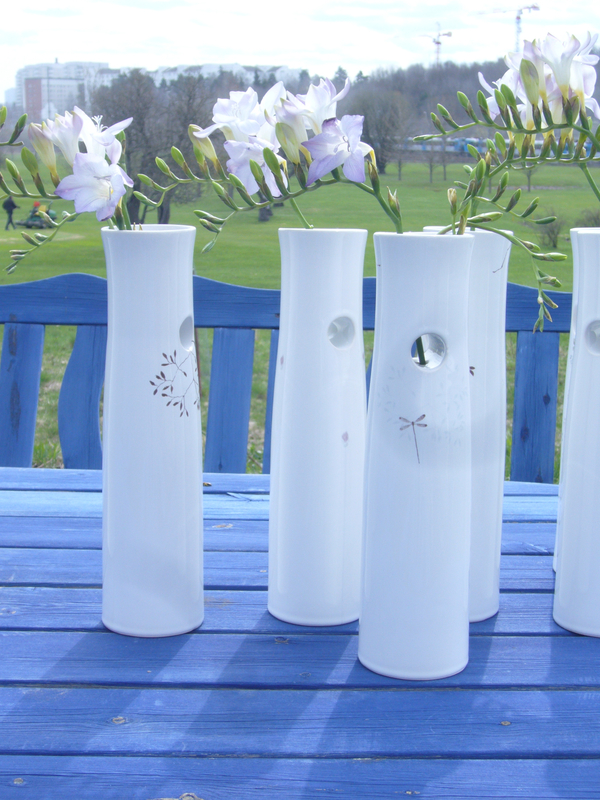 I let the Stem vases out onto the blue table when I was re-displaying at manos the other day. They looked so lovely! I’ve got a new batch of hanging flower pots which will be in the shop on Monday! 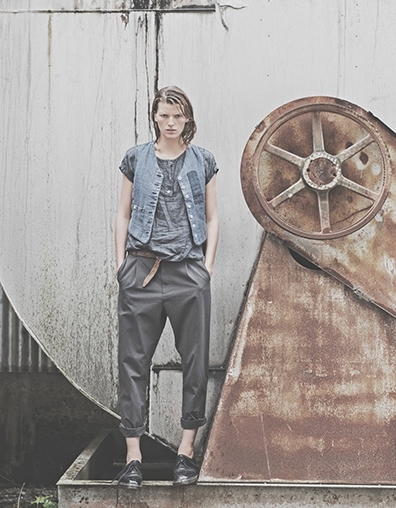 You are currently browsing the archives for the shop interior category.